This article is a short summary of Mario Kart 64 (slot machine). Mario Kart 64 is a slot machine for arcades, based on the Super Mario series, specifically the Mario Kart sub-series and Mario Kart 64 for the Nintendo 64. 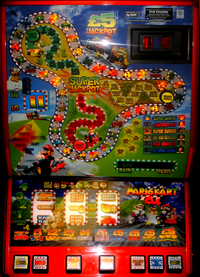 The game appears to work as a traditional slot machine, but is branded after Mario and apparently has music and sounds based on Mario Kart 64. It was one of multiple arcade machines Maygay produced, based on multiple game and media franchises like Pac-Man, Tomb Raider, Donkey Kong, Tetris and lesser known ones such as Mr Do!. This page was last edited on 6 April 2019, at 15:52.